Want something only available in Japan? These services, which will buy and ship them to you, are easier to use than you think. William Rees is the man behind A Treasury Of ..., a witty blog filled with eclectic and eccentric, yet always attractive, finds. The stylish curiosities range from WWII soldier pamphlets and retro Japanese pens to Levi's Vintage tees and DIY paint-splattered shorts. And in his unending search for all things cool, he often finds pieces unavailable in the States. When he's got to have it, he enlists the services of a proxy. Of course, he wasn't always so bold. 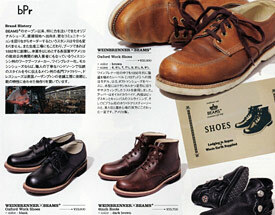 Here, he shares his first experience ordering a pair of shoes from one of Tokyo's top shops, Beams. From shopping brick and mortar stores to managing an online auction, these services can handle any sartorial request—for a fee usually ranging from 15 to 35 percent of the item's cost—or simply shop from the items featured on the site. Inevitably, once you fall down the rabbit hole of online menswear shopping, you're going to crash down hard upon some ultra-American-looking dream piece available far from our shores, and only in Japan. For me, the impossible-seeming dream goods were a pair of Weinbrenner x Beams Plus work oxfords spotted online last summer in a scan from an issue of Free & Easy magazine. For months, neither eBay, nor Google, nor the jibberish Japanese text on any of the Beams web shops got me a single step closer to my must-have shoes. But then, days before Christmas, a wise Russian left a comment on my blog which trumpeted the transformative power of online proxies. For a moderate up-charge, sites like JapanGoodsFinder.com would ship to American customers directly. I had reservations—lots of them, actually. At the time, the Japan Goods Finder site was a little under-designed to the point of seeming a tad scammy. But transactions begin with a simple, no-obligation inquiry email so what did I have to lose? Within hours, a polite e-mail in perfect English pinged into my inbox, clearly written by an actual person and not a machine. The service agent's message explained that my shoes were available in the size I'd inquired about and attached a link to a PayPal invoice if I was interested in ordering them. I was but one click away from my making my dream shoes mine! But I walked away from my computer, tense-chested with concern. With the shipping and proxy fees included, my shoes would end up costing a good deal more than a new iPhone, and what would I do if they didn't fit? But eBay can rinse any material mistake away, I reasoned. Plus the holiday season was reaching its peak. "Merry Christmas", I whispered to my self heavily, then I PayPal-ed the proxy as if parachuting out of a plane; my eyes locked upward, my fingers crossed. Hours later, I was panicked anew. I know I had been wearing all my shoes too small for years, and the only thing worse than $400 Japanese shoes would be $400 Japanese, painfully tight shoes. But why had I ordered the Thorogood/Weinbrenners so drastically large? I quickly emailed my agent and asked if it was too late to order a size down. It wasn't. Someone was on their way to pick up the shoes in person from one of the Beams stores later that afternoon, she mentioned. Less than two days later, on December 23, my shoes arrived on my snowy front step. (Sweet Baby Jesus! Ordering from J. Crew takes twice as long!) But, honestly, I was too worried to have a $400 mistake hanging over my head all Christmas, so I waited until after the holiday to open them. When I did, they were pure perfection. They fit right, they looked right; my aesthetic transformation into a Wyoming Woodshop Teacher was well underway at last!